– A nursery rhyme that’s a metaphor for the cost of fulfilling your dreams… OR IS IT ? IS IT ? Crashlands is a comedic craft-and-survive indie video game that really wants you to know that it was made in St. Louis . For more context, see our profile for protagonist Flux Dabes. Baconweed is a flower native to the majestic savannahs of Woanope (though one could debate their exact degree of majesticityness). It has orange petals and is said to have a pleasant aroma. Based on the name, we shall BRAZENLY ASSUME that it smells like bacon. The sight and smell of baconweed is considered soothing by locals with frayed nerves. It is also edible (presumably, one eats the root), and can be prepared as a smoothie. Its medicinal properties extend to being a major component in healing potions. But in-universe, healing potions might be closer to a stimulant and stress relief medicine. 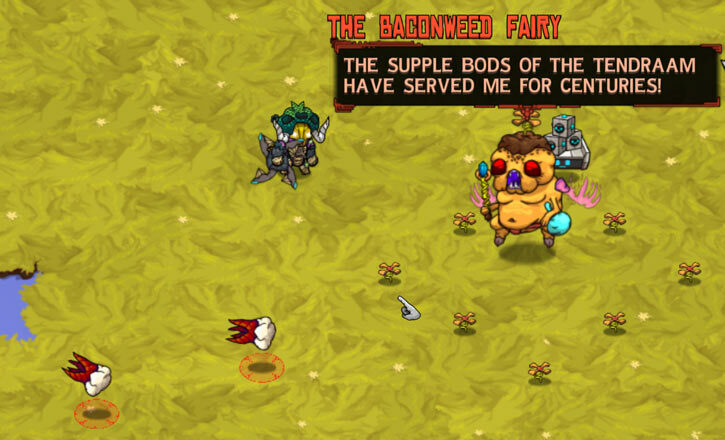 There are nursery rhymes about the “baconweed fairy”, a magic creature akin to the tooth fairy. It grants wishes in return for sacrificing one’s teeth. It’s a metaphor, obvs. As it turns out, the Baconweed Fairy does exist, and is an entity of non-trivial power. She might be the same sort of being as the gods of Woanope, such as Maarla the plant goddess and her enemy Baary the mushroom god. 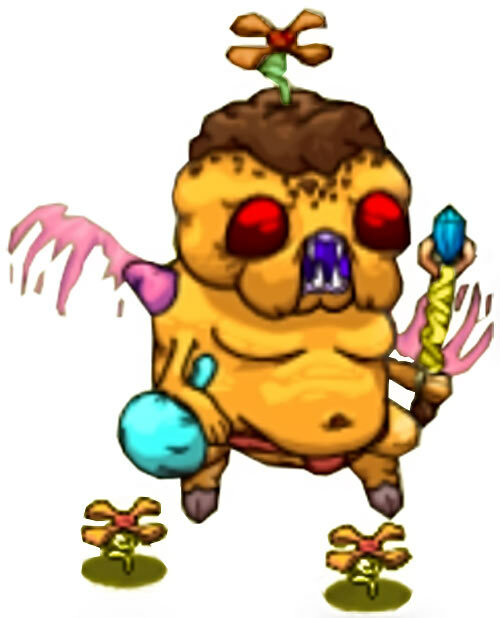 The Baconweed Fairy is actually the one who started the rumours about granting wishes in exchange for sacrifices of teeth. It was a way to lure the gullible to her. Over centuries, the Fairy used this grift to unexpectedly possess these locals. This greatly prolonged her lifespan. Since she did it for centuries. WEREN’T YOU FOLLOWING ? This murderous and really ugly as well now that I think about it scam lasted for… for ? Yes, centuries. Good, good. Then a Shipment Shipping Shipper from the Bureau of Shipping, Flux Dabes, discovered the truth. So she terminated the Baconweed Fairy. This involved lots of circle-strafing, DOTs and cooldowns, for some reason. I couldn’t help but notice that it often does. This defeat was catastrophic for the Fairy. Flux’s body and other resources would have allowed her to get off-world. Presumably, the Fairy wanted to scale up her murderous scam, and/or have access to more formidable vessels. Dastardly ! A documentary about designing/drawing this character. The Fairy’s body is based on that of a Tendraam, the half-goat, half-plant natives. Therefore — and the logic here is impeccable — she can hover above the ground for as long as she wants, and move around with her small wings. Though she can be hurt by a sufficiently hefty melee weapon, the Fairy has tremendous endurance. She can take many such blows. Many many. She is also terribly strong, but thankfully she’s quite slow. On the gripping hand, the Baconweed Fairy occasionally uses some sort of spell to launch herself in the air and attempt to land on/dropkick her foes. This takes places at a preternatural speed, but can still be avoided by an experienced fighter. Are *you* experienced ? She can even heal damage through a “bacon nap”. It seems to involve drawing reparative power from the soil – presumably from baconweed seeds or roots. This trance can be interrupted to prevent her from regenerating. To do so, one must be able to deploy wickedly intricate occult disruptions against her dweomer -weaving. Such as a good kick in the face, oi. One assumes that if a victim is stupid enough to say the submission chant (above), she can kill them right away and get an intact body. Many gullible Tendraams have sacrificed their teeth to the Fairy, as she reeled them in until she could take over their body. She kept the teeth, and turned them into impaling, exploding, homing missiles. She has many of those, and won’t hesitate to use them if she realises she’s in a serious battle. An agile person can evade the teeth – especially by doing dive rolls so the missiles will swoop down and hit the soil instead. But this in turn means that the Fairy can force her opponents on the defensive, as they focus on evading her teeth missiles. Sometimes she’ll fire a volley of those. On one hand there are too many for her to control so they’re more like high-angle attack rockets. On the other, well there’s a lot of them and they explode embiggenedly compared to her ordinary ammunition. If circumstances are bad enough, the Fairy can also release a shower of blue explosive orbs from her body. It *can* be avoided – sprint away so the individual orbs that comprise the explosion have dispersed enough, and dodge between orbs. But this too keeps people on the defensive, and most opponents will be taken by surprise by the first such death-flagged deflagration of cerulean spherules. YOUR TEETH, YOUR SOUL AND YOUR BODY ! ALL WILL BE MINE ! Damage transference can transfer RAPs of damage to the soil underneath. However taking any RAPs (even if LDD’d) during that Phase ruins the transfer. Damage transference can “treat” Damage Capacity’s Current Condition as well as her BODY Current Condition. Personality transfer can be used on a fresh corpse. Personality transfer can only attack a living person if they just said the submission chant. Martial Artist can only be used for AV in the same Phase where she has used Jump. Immortality (but she needs to keep acquiring new bodies), Insta-Change (between her currently-possessed body and her full form). Strange Appearance (and she also gives strange energy readings in any form), MIA toward Collecting the teeth of sapient beings. TEETH MISSILES [BODY 02, EV (Area of Effect 0 APs) 05, AV 04, Running: 04, R#02, Limitation : Running can only be sustained for three Phases (-2)]. The Fairy cannot boost the AV of these using HPs. TEETH MISSILES VOLLEY [BODY 02, AV 03, EV (Area of Effect 2 APs) 06, R#02]. The Fairy *can* use HPs to boost the AV of those. Oh, no ! Do something ! 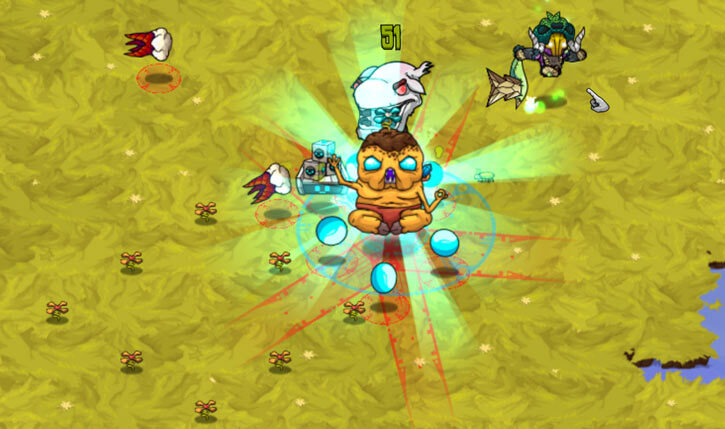 The power level in Crashlands seems modest, at least at the Savannah stage. But since the Fairy is a boss, she could credibly be scaled up to challenge more powerful characters. By Sébastien Andrivet and the Bureau of Shipping. Source of Character: Crashlands video games. Writeup completed on the 3rd of July, 2017.